A luxury yacht off of Leeward Beach on Providenciales. A private charter allows for the excursion to be tailor-fit to your exact destination, activity and dining preferences, albeit at a higher rate than on shared cruises. Visiting the incredible beach at Fort George Cay. 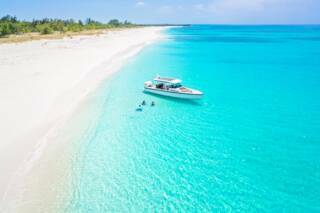 Providenciales offers an excellent selection of luxury yacht charters across a wide range of vessels. The majority of luxury private charters do not follow a fixed schedule. Rates are typically based off of half or full day prices, with departures times according to customer’s wishes. If guests are staying at a beachfront accommodation, charters will usually offer passenger pick up directly in front of their hotel or resort on the world famous Grace Bay Beach. For those staying at one of the remote luxury resorts in the Turks and Caicos, such as Amanyara or Parrot Cay Resort, additional fees may apply. For those that would rather depart from a marina, land transport can be arranged. When compared to a shared cruise, a private charter is often the better choice for groups a large family, even considering smaller party sizes, as total rates are often comparable. Most excursions will be able to cater to your exact dining and refreshment preferences. Typically, a wide complement of alcoholic and non-alcoholic beverages, fresh snacks and fruit is offered on half day excursions, and lunch is included on full day adventures. Most boat cruises in the Turks and Caicos offer the quintessential bottomless rum punch, yet the luxury charters tend to have a wider and better range of beverage choices, including wine, imported beers, champagne, and rosé. Beach lunches and BBQs are another great option. There’s no better dining setting than one of the perfect white sand beaches in the Turks and Caicos. The larger tour vessels feature galleys, so dishes can be created fresh. Most charters are able to cater to specific food requests if needed. Inquire when you book for details. Half Moon Bay Beach. This exquisite beach is located between Water Cay and Little Water Cay and is a top destination for boat cruises. A great aspect of a private boat charter is that you’ll be able to customize the adventure how you’d like, unlike on the scheduled cruises, which tend to follow a regular routine. 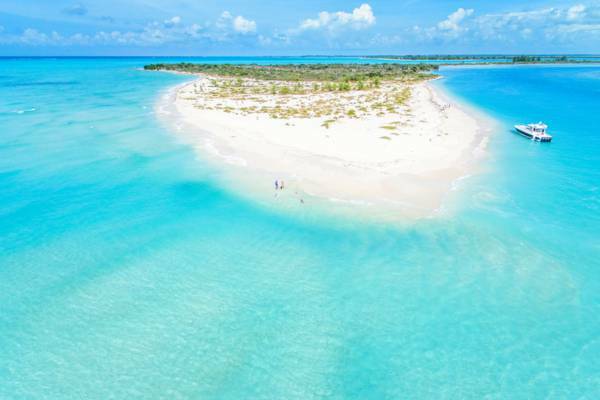 A Turks and Caicos yacht charter is one of our top vacation activities, simply because it offers a little of everything that makes our archipelago a great destination. The most popular thing to do on excursions is simply to discover and relax on one of our may uninhabited cays. 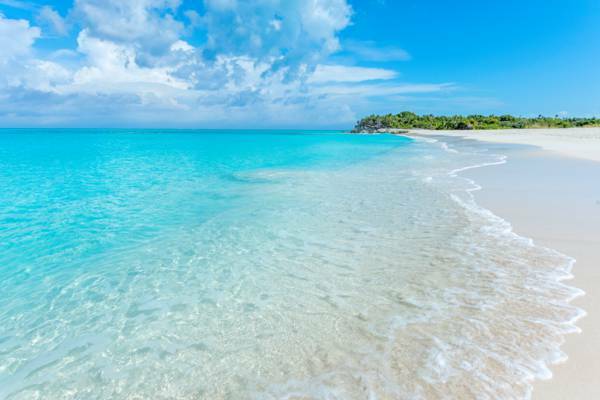 With over 100 named islands and cays, the Turks and Caicos certainly doesn’t disappoint in this regard. Island cruising brings a little of everything. There are great beaches, coral reefs to snorkel on, and iguanas to see. A yacht charter can also be equipped for scuba diving or deep sea fishing as well if so desired. The sandy islands of Little Water Cay, Water Cay, Pine Cay, and Fort George Cay are favourite destinations, yet some of the cays further afield also hide spectacular sights. Little Water Cay, often referred to as Iguana Island, is a Turks and Caicos Islands Rock Iguana sanctuary and tropical beach paradise. The iguanas are large and friendly lizards, and are quite approachable. French Cay is one such spot. Renowned for its incredible wall dive sites, this tiny nature reserve islands also attracts fascinating birdlife and nurse sharks. The vibrant barrier reef off the Caicos Islands. 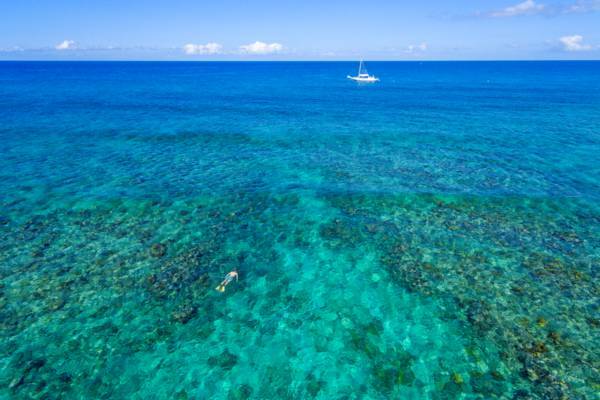 The Turks and Caicos hides a wonderful array of snorkelling reefs, and no two sites are alike. There are small sheltered reefs that support wide menageries of reef fish, barrier reefs with incredible yellow sea fan beds, and the deep blue open ocean off the wall. As custom cruises are more likely to travel the extra distance to the best locations, the chances to spot dolphins and whales increases. It’s truly an unforgettable experience to snorkel with these majestic sea mammals. 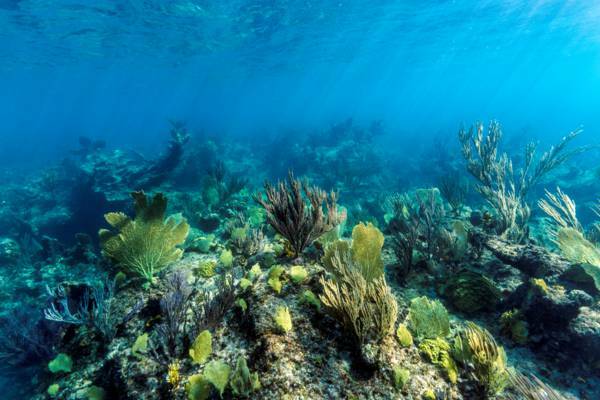 There’s always an incredible array of underwater sights to explore in the turquoise waters, including miles of coral reef, vibrant and colourful fish, lobsters, conch, and the national icon of Jojo the Dolphin. A crew member typically acts as a snorkel guide, and is often able to point out many interesting and well-camouflaged sea creatures that would otherwise go unnoticed. Small-group scuba diving is another great activity. You’ll have the full attention of dive masters, a less hectic space to set up in, and you’ll get to see the interesting marine life before it’s scared off by others. Typically, most dive trips consist of two tank dive in the morning, which leaves time for other activities in the afternoon. Snorkelling at the barrier reef off of Providenciales in the Princess Alexandra National Park. Interested in trying your hand at fishing? Deep sea sport fishing and bottom fishing is great in the Turks and Caicos, and you’ll won’t have a long journey out to the prime fishing grounds either. West Caicos is another amazing destination, with features that everyone will enjoy. There’s Bernard Bay, a sheltered beach with perfect water, scenic coastal cliffs and snorkelling, the historical site of Yankee Town, and the impressive wall diving of the West Caicos Marine National Park. 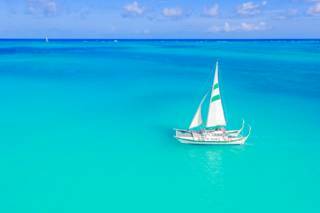 The Caribbean offers some spectacular ocean hues, yet the incredible blue waters off in the West Caicos Marine National Park have to be seen to be believed. Due to the travel distances from Grace Bay, many of the scheduled cruises don’t make it out to West Caicos. A private yacht charter is the perfect way to discover this pristine coast. Luxury tour yacht in the Turks and Caicos. 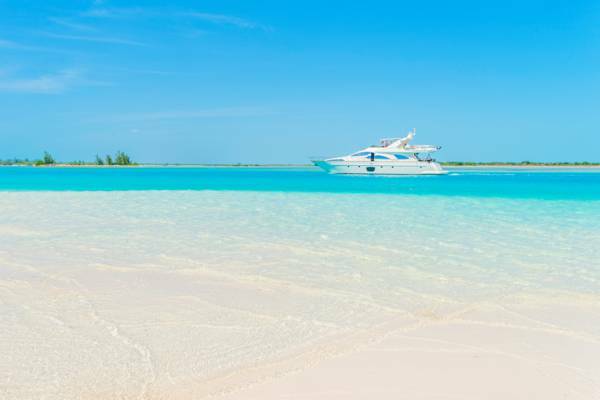 There’s an incredible selection of excursion boats in the Turks and Caicos, ranging from small open vessels to extravagant 80 foot (25m) yachts. Many of the luxury yachts are larger than the typical tour boats, which in turn tends to offer a smoother ride as well. They also often feature enclosed and air conditioned cabins, complete with bathrooms, comfortable seating and other amenities, and in some cases, bedrooms for overnight expeditions. The sun is often intense in the Turk sand Caicos, and it’s pleasant to have a shady retreat to escape to. A few of the larger private charter yachts have their own jet skis or waverunners. 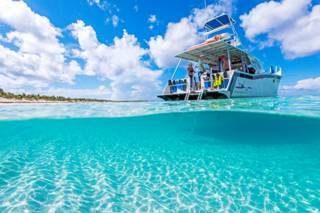 These small water craft are a very exciting way to explore the crystal clear waters of the Turks and Caicos. Yacht excursions can be booked directly through the charter business (which typically results in the best rates), or through your local accommodation or concierge service. During the December through February high tourism season, availability may be limited and it’s advisable to make reservations well in advance of your scheduled visit. A 12% government tax is applied on tour prices. Most private charters require a deposit upon booking. Be aware of cancelation policies. Due to the limited number of local tour vessels, cancelling an excursion close to the scheduled departure date may incur stringent fees as it is unlikely that a new booking could be made with little notice. If a tour is cancelled due to weather, a re-scheduling or refunding is typically offered at no charge.